We are still under such high temps here and managing to get dinner on the table without cooking and avoiding take out has been my challenge. 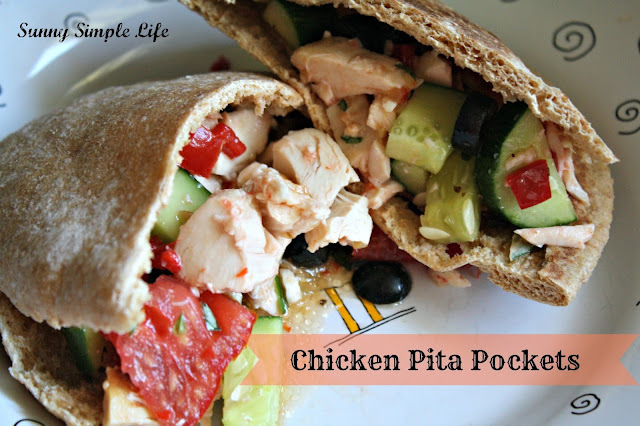 One of the meals we enjoyed was simple summer chicken pita pockets. So easy and super yummy. Take one roasted chicken from the grocery store or roasted in your crock pot and shred. Toss with tomatoes, cucumbers, roasted red peppers, fresh herbs, feta cheese, sliced olives. Stuff in a pita pocket and drizzle with salad dressing. You can use bottled or my easy vinaigrette dressing to top the chicken pita pocket. Serve and enjoy. Filling and light. Perfect for warm weather evenings or just a night you need a healthy quick supper. Third installment in my Simple Christmas countdown series. I love that kind of supper! Looks perfect for a summer evening. Looks and sounds YUMMY ! Thanks for sharing ! Have a good weekend ! Those sandwiches look great - something I could take for lunch. Thanks for the recipe.